Tiger Lilies or Lilium Lancifolium (syn tigrinium). 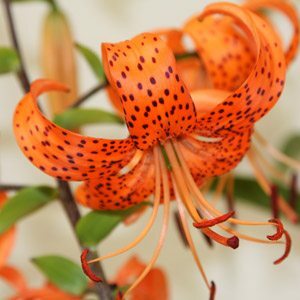 This is the Orange red Turkscap Lilium known widely as the ‘Tiger Lily’. Dark spots or markings on the flower or stem and reflexed petals. Tiger Lilies can produce 20 – 40 flowers on the tall stems. Generally a hardy and long lived lilium that does well in a range of conditions. Will reach well over 1m and flowers late in the season Feb – March. Tiger Lilies can easily be growm in pots or containers, avoid areas exposed to strong winds. Lilium Lancifolium (Tiger Lily) bulbs can be planted from winter to early spring. Tiger Lilies grow well in full sun to semi shade and do best in a humus rich well drained soil, however the ‘Tiger Lily’ will cope in a range of conditions. Lilium lancifolium var splendens has larger flowers but is shorter stemmed. Lilium Lancifolium Rubrum is the red tiger lily. Tiger Lilies are commonly found in older gardens across Australia. In Asia they are said to represent wealth and pride.